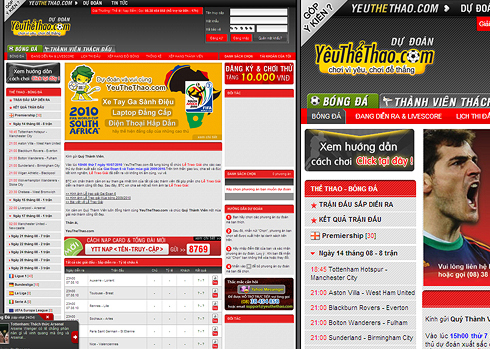 YeuTheThao is the leader in online sports media in Vietnam, delivering news, information, and prediction games across multiple channels. The company’s online products include: YeuTheThao, a sports prediction game site; BongDa, Vietnam’s leading football news portal; and TinTheThao, a sports news portal. BongDa has become one of the most popular sites in Vietnam, with traffic in the top 30 overall. For print channels, YTT’s exclusive partners include Vietnam Sports Weekend Newspaper and Cars & Sport Magazine. The company has also expanded its reach to mobile, integrating with Diadiem Vietnam 2.0, a mapping and directory service that is one of top most popular free apps on iPhone.